The paranormal is a subject with seemingly limitless fascination for us, and in which people continue to hold as part of their belief systems. A Gallup poll taken in 2005 indicated that 30% of people believed in ghosts and 15% claimed to have seen one. Another survey taken in 2008 had 58% of respondents stating they believed in the supernatural – more than believed in God (54%). Professor Richard Wiseman states in his latest book that between 40% and 50% of people in the UK (and between 80% and 90% in the US) claim to have had some sort of paranormal experience. These are extraordinary figures. For all that we live in a well-educated society where science is more readily accessible than ever before, belief in the things that go bump in the night is still remarkably persistent. 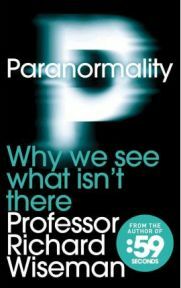 As an arch-sceptic and Britain’s only Professor of the Public Understanding of Psychology, Wiseman has investigated the paranormal for over twenty years, and all his experience has been poured into his latest book – Paranormality: Why We See What Isn’t There. In Paranormality, Wiseman takes us on a whirlwind tour around several areas of paranormal activity – such as precognitive dreams, ghosts, fortune telling, telekinesis, mediumship and out of body experiences – pulling each apart in turn and showing us how science can provide an alternative explanation to the supernatural as to why these things happen. Be it an interesting quirk of our psychology, wishful thinking or simply a con, Wiseman is adamant that nothing supernatural exists. As well as cheerfully debunking all claims of such activity presented to him, he also goes one step further and argues that investigating such cases can actually reveal more about the way the human brain works. Take the case of one of the most common types of supposedly paranormal experience: the incubus (or succubus, the female form of this beastie), a monster that appears on the chest of sleepers when they awake in the night, restricting breathing and movement, and causing terrifying visions. It was once commonly believed that seeing such a vision was proof of the existence of demons, but the psychology of sleep has revealed it as a condition called sleep paralysis that happens when the brains doesn’t switch correctly from sleeping to waking. Other sections on how and why our brains sometimes fail to accurately represent reality were fascinating stuff, and you can even learn how to experience lucid dreaming or an out of body experience if you so desire. While the book was well-written, full of lively examples and interesting “try it yourself” experiments, I felt it was more persuasive in some places than others. The sections relating to the psychology of sleep were especially fascinating for me as they were well backed up with convincing and quite detailed scientific explanation. However, the chapter on mediumship was nothing more than a bit of a rehash of well-worn “how to cold read” material with nothing new to offer. Anyone who has ever watched Derren Brown’s TV shows or read anything on sceptical investigation will be very familiar with such material and will find nothing new here. It would serve as a decent introduction to the subject for anyone new to this sort of material, however. I did also wonder if there was any research to be found that showed up positive evidence of any of these weird phenomenon; certainly nothing was mentioned in the book but absence of evidence is of course not evidence of absence. It is all well and good debunking obviously silly things like the experiment to try and weigh the soul at the moment of death (21 grams, apparently), but what about looking into some good, recent scientific studies that show up evidence that these things might just exist in some way after all? You may think that in saying this I am one of those people I mentioned earlier who have had an unexplained event happen to them or who desperately want to talk to the dead – but I am not. That I am a sceptic makes me want to see these things all the more: good science tackled as well as the obviously barmy bits. If these theories are to hold up, they need to work in all circumstances, not just against the easy targets that are often presented here. Despite my slight disappointment that this was science-lite in a few places, for the most part this is an eminently readable and enlightening tour of parapsychology that is bound to have wide appeal. Even you aren’t quite convinced by one or two things, it is certainly enough to get you thinking about these effects for yourself, which has got to be a good thing. Fox Mulder once famously said that “the truth is out there”, but I am more inclined to believe that the truth is in here, albeit in an introductory format. Final rating: 3/5 – recommended to newcomers to these ideas, but less so to those who already have a familiarity with sceptical inquiry.